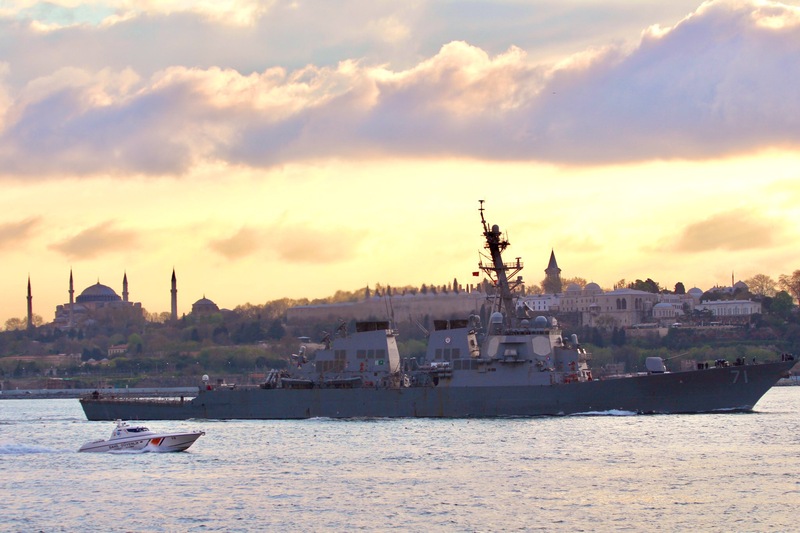 The guided-missile destroyer USS Ross (DDG-71) entered the Black Sea over the weekend, the fourth time in 2019 a U.S. Navy ship entered the body of water. Ross is “conducting maritime security operations and enhancing regional maritime stability, combined readiness and naval capability with NATO allies and regional partners,” according to a statement released Monday by U.S. 6th Fleet. The U.S. Navy’s operations in the Black Sea are consistent with international law and the Montreux Convention, according to the 6th Fleet statement. The Montreux Convention, signed in 1936, stipulates non-Black Sea nations can only send warships with displacements of less than 15,000 tons into the Black Sea and these ships can only stay for 21 days. USS Donald Cook (DDG-75) visited the Black Sea in February, the second time this year the guided-missile destroyer entered the region. In January, amphibious warship USS Fort McHenry (LSD-43) entered the Black Sea. While in the area, Fort McHenry visited the Romanian port Constanta and conducted a joint exercise with Romanian frigate Regele Ferdinand (King Ferdinand) in Romanian territorial waters. However, Russia has long considered the presence of warships from non-Black Sea nations as a threat and regularly tracks their movements from the sea and air. “The Black Sea Fleet forces are constantly monitoring the movement of the U.S. Navy’s Ross guided-missile destroyer that entered the Black Sea on April 14, 2019,” said a statement issued by the Russian National Defense Management Center, reported by the state-run TASS news agency. A Russian Navy Vasily Bykov-class patrol vessel and Russian Navy reconnaissance ship Ivan Khurs were reported to be monitoring Ross’ movements, according to the TASS report. With the recent uptick of NATO activity in the Black Sea, political commentators in Moscow are pushing their government to call for a rethinking the Montreux Convention, according to an April report by regional expert Paul Goble for the Jamestown Foundation in Washington D.C.
Any actual push by the Kremlin for changes to the Montreux Convention will likely occur behind the scenes, Goble states in his report. The Russian government probably would welcome new limits of foreign ships entering the Black Sea but needs Turkey also to support new talks.